Two straight metal album reviews. I know, we don't like metal that much here, but it so happened that three bands we do like released new albums on the same day. And there is a bunch more metal in the pipeline, though most of it won't be released for a while. 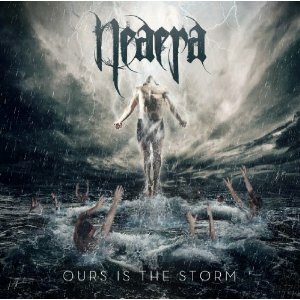 Today's review is the third most anticipated music release from March 5, 2013: The new album from Germany's Neaera. Like Soilwork yesterday, Neaera is a band with their own established identity, however much less known than Soilwork. This band actually plays a somewhat similar style of metal to Soilwork, but nastier and more extreme. Neaera's forte is a bruising gallop of chugging riffs, pummelling drums, and guitar leads swirling beneath the surface. Neaera are certainly masters of crafting songs that make listeners want to throw up their horns and bang their heads. The riffs and drums are punchy and create an impressive and crunchy groove that makes heads spin. Bubbling beneath the considerably heavy surface in most songs are snaky guitar leads that lend atmosphere and melody to the meat. Most bands resort to keyboards to achieve this end, but Neaera is different from the rest. What sets this band apart is the vocal style. One second the singer emits throat-shredding shrieks, while the next he bursts forth with impressive belows that fall somewhere below the bass register. He switches back and forth from these styles effortlessly while also mixing in higher-range old school metal screams. Very rarely does this band give in to using clean singing, and even when they do, its is more like an Iron Maiden-esque array of falsetto singing. On "Ours is the Storm" this style of singing appears on just one track. From start to finish this is a very heavy record. There are no interludes or preludes or intros or outros or lead-in tracks or filler material. Just thirteen pummelling melodeath tracks that are easy to nod your head to. On this disc, Neaera offer nothing flashy--nothing that calls attention to itself. Like Soilwork's new album, the band sees little need to bring anything new to the table besides a bunch of killer tracks. That said, "Ours is the Storm" is a good album, just not a great one. If you are in the mood for some insane headbanging metal, you can't go wrong here. Check out a couple of the tracks below. Enjoy!